This is one of those episodes where we received many vendor questions and comments. It's a jam-packed show that ran over by almost 30 minutes. See what you missed… by clicking play above or watching the video below. You can leave a question or comment for the show at www.learnhotdogs.com/feedback or you can just click that little tab over to your left. I will do my best to play your question during the live show and get some answers to you. Vendors have asked me for years to create a training video series that shows the actual work on the cart. We went one step further, we recorded the entire vendors business, from storage, to prep, to setup and serving. After almost 2 years of a weekly live show, we've started a new show schedule. 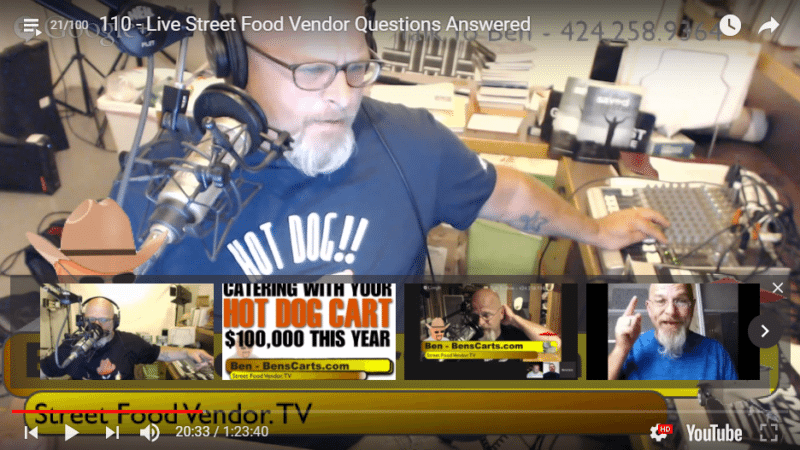 Hot Dog Vendor Radio and StreetFoodVendor.tv will be live on the first Sunday of each month, 9:PM EST. Join us and let's all become better vendors.